William Clement Frawley (February 26, 1887 – March 3, 1966)was a stage and screen actor, with well over a hundred films to his credit, but gained greater fame in television as Fred Mertz on I Love Lucy and as "Uncle" Bub O'Casey on My Three Sons. He began in vaudeville and possessed of a fine singing voice in his younger days. It was supposedly Frawley, not Al Jolson, who introduced the song "My Mammy" to vaudeville audiences. He was also an early and persistent exponent of the hit song "Carolina in the Morning". His film credits include Miracle on 34th Street (1947), in which he portrayed "Charlie", the judge's campaign manager, and B-movies like Treat 'Em Rough (1942) with Eddie Albert and Peggy Moran. On I Love Lucy (1951) and on The Lucy-Desi Comedy Hour (1957), Frawley played Lucy and Ricky Ricardo's friend and landlord Fred Mertz. He and Vivian Vance, who played his wife Ethel in the series, had great chemistry on screen, but in real life had a dislike for each other. This was attributed to her vocal resentment of having to play wife to a man 25 years her senior, which she took as an insult. When he got wind of it, it offended him so he never forgave her. 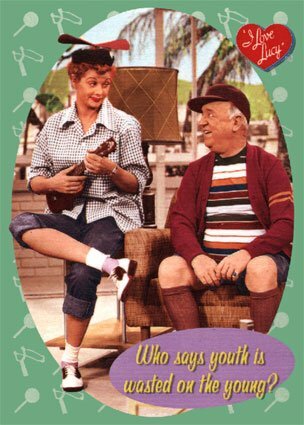 The two co-stars were given the opportunity to move into their own "Fred and Ethel" spin-off once Lucy had run its course in 1960. Despite his animosity towards her, Frawley saw a lucrative opportunity and was game, but Ms. Vance nixed the idea, having no interest in ever working with Frawley again. He never forgave her for this, since the series could have made him extremely wealthy. William Frawley next hit it big on My Three Sons 1960 in his role as "Uncle Bub" O’Casey, a role he played from 1960 to 1965. The original premise for the series was for Frawley to be the show’s star, overseeing three nieces, but the network decided to switch the kids to boys, then snapped up Disney’s top movie star Fred MacMurray as the lead when he indicated interest after they offered him a preposterously shortened work schedule, relegating Frawley to another supporting role after all. Frawley reportedly never felt comfortable with the out-of-sequence filming method used on My Three Sons after doing I Love Lucy in sequence for years. Most television series are filmed out of sequence, but My Three Sons was unusually so, to an almost surreal degree: each season’s episodes were arranged so that series star MacMurray could shoot all of his scenes during a single intensive two-week period; Frawley and the other actors worked around the absent MacMurray the rest of the year. It was a very different experience from the sequential filming schedule of ‘ ‘I Love Lucy’ ‘. By almost all accounts, Frawley’s off-screen personality was not that much different from his on-screen demeanor. A notorious misanthrope, with one brief failed marriage behind him and a fondness for the bottle, he lived in the same bachelor apartment most of his years in Hollywood. According to Desi Arnaz’s memoir A Book, Frawley eventually lost his driver’s license due to drunk driving, and befriended a cabbie who drove him around regularly. When deciding whether to hire Frawley for the role of Fred Mertz on I Love Lucy, Arnaz made it clear to him that, if he showed up drunk for work, he would "work around it" twice, but after that, Frawley would not only be fired from the program but blacklisted throughout the entertainment industry. Frawley, whom no one would hire at that point, readily agreed. He never showed up drunk to work, and in fact, Arnaz became one of his few close friends. Poor health forced Frawley’s retirement. He was dropped from My Three Sons after the studio could no longer obtain insurance on him. He was angry about being let go, and developed a dislike of actor William Demarest, who replaced him, accusing him of stealing his job. (One of his final performances was an October 1965 guest appearance in Lucy’s subsequent series The Lucy Show (1962-1968). He collapsed of a heart attack on March 3, 1966, and died, aged 79. He had been walking along Hollywood Boulevard after seeing a movie. After he died, Arnaz took out a full-page ad in the trade papers, consisting of Frawley’s picture, framed in black, and three words: "Buenas noches, amigo!" Vance’s reaction was the polar opposite. She and her second husband were dining out when they heard the news, and reportedly, Vance shamelessly shouted, "Champagne for everybody!" Frawley is buried in the San Fernando Mission Cemetery in Mission Hills, Los Angeles, California.